"For physical fitness is not only one of the most important keys to a healthy body; it is the basis of dynamic and creative intellectual activity. The relationship between the soundness of the body and the activities of the mind is subtle and complex. Much is not yet understood. But we do know what the Greeks knew: that intelligence and skill can only function at the peak of their capacity when the body is healthy and strong, that hardy spirits and tough minds usually inhabit sound bodies." Movement starts with you! It's not just the job of the P.E. teachers to instill lifelong fitness habits. Administrators, teachers, students, and families all get to promote the benefits of exercise, mode it daily, and encourage community effort. This approach is referred to as a Comprehensive School Physical Activity Program (CSPAP). 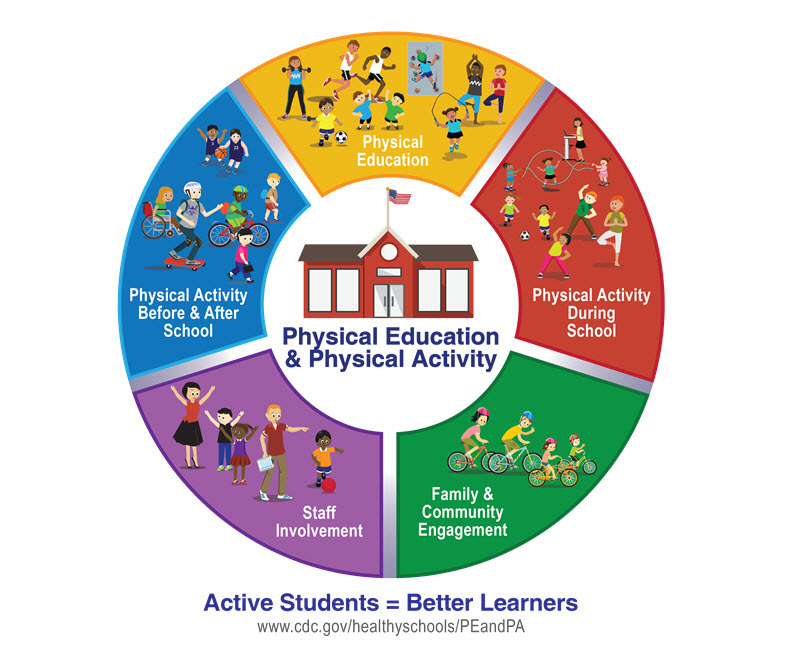 The goal of CSPAP is to increase physical activity opportunities before, during, and after school and increase students’ overall physical activity and health. What can you do to help? The US Department of Health and Human Services provides guidance on healthy physical activity habits. The national recommendation is that children and adolescents aged 6 to 17 years should have 60 minutes (1 hour) or more of physical activity each day. These guidelines also encourage children and adolescents to participate in physical activities that are appropriate for their age, that are enjoyable, and that offer variety.